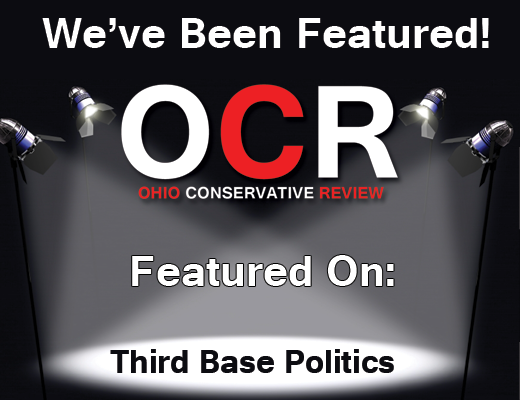 Launched May 8th, Ohio Conservative Review (OCR) has already been featured on one of Ohio’s most popular political blogs, Third Base Politics. The post featured on 3BP’s website was a commentary on the ideals that OCR’s writers expressed in numerous articles. Adam Josefczyk, OCR’s Executive Director, wished to thank Third Base Politics and issued the following statement: “Third Base Politics’ willingness to promote our site and engage our experienced writers is exciting, and we welcome future debate and discussion that we hope 3BP will provide.” Josefczyk also had the OCR staff create and send an open letter to 3BP, inviting them to engage further in the conversation by contributing an article for publication on OCR (the letter can be read HERE). OCR’s website, www.ohioconservativereview.com, was launched only hours before being featured in 3BP, and served over 4,000 pageviews on its first day. Justin Powell, Communications Director for OCR, said that while being featured in 3BP was certainly beneficial in getting the message of OCR publicized, most of the traffic on the first day came organically from people across the state interested in an open debate about conservatism in Ohio. “We of course are excited and honored to be featured on 3BP, but we are ecstatic by how much traffic and engagement we received from conservatives across Ohio who have offered to write articles for the site, and even to promote the conservative messaging that OCR offers,” Powell said Thursday morning. Ohio Conservative Review is a platform for conservative beliefs to be expressed, debated, and promoted across Ohio. It can be accessed at: www.ohioconservativereview.com.